Riesling is regarded as one of the greatest wines in the world, and indeed it is. But, it is also often a confusing topic. It comes from various places in the world and it boasts a different history, flavor profile, and character in each place. Of course, we know that Austrian Riesling is dry, unless it is purposely sweet, and exhibits intense mineral flavors with stone fruits, citrus, that are great wines for aging. Young Riesling wines exude charming fruitiness and flavor, and can develop into great and complex wines through aging. For these, notes of stone fruit are dominant and include peach, apricot and exotic fruits. Wines especially from the terroirs of the Wachau, Kremstal, Kamptal and Traisental reflect a minerality reminiscent of slate or flint. Riesling ripens slowly and reaches the highest quality as aged wines with rose-like scent. Depending on the level of ageing, they develop a pleasurable petrol tone, something that perhaps not all wine consumers like. When the late harvest grapes are infected with noble rot, then special wines are the result – Auslesen and Beerenauslesen styles with outstanding quality. Let’s back up. Tonight, Wednesday, August 6, 2014, Austrian Riesling will take over Terroir Wine Bar in Murray Hill, New York, from 5pm onward and feature a variety of activities from a Sound of Music singalong to a dirndl march down Third Avenue… but most importantly, it will be a celebration of wines from Austria with a special bottle being opened every hour, on the hour, from great Riesling producers of the country. Read more about that here. 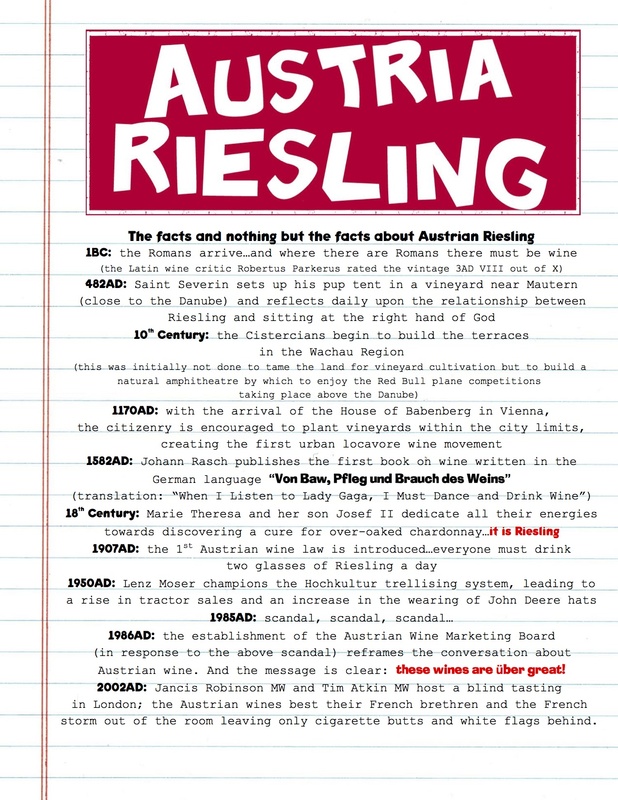 Because of this, it’s time we let you in on a little “secret.” Hearth Restaurant and Terroir Wine Bar‘s Paul Grieco was nice enough to put together the facts (and nothing but the facts) on Austrian Riesling two years ago as part of the Ode to Austria celebration in Chicago. This being the last year of the Summer of Riesling, we thought it was high time we let those who haven’t crossed through the doors of one of their establishments to have a glimpse at this great document. **Note: Admittedly, not all of these facts are true, but they are entertaining. Some genuinely are… can your guess which ones? For the real lowdown on Austrian Riesling, please check out AustrianWine.com.